First in points scored. First in free throws. First in field goals. And now this school record-setter is the first in UB basketball history to be drafted. Congratulations, Cierra! New renderings of the international eatery that will transform campus dining at UB reveal a large, inviting space full of light and windows. A new UB study finds that despite receiving less prenatal care, African refugee women experience healthier pregnancies than women born in the United States. A UB researcher, among the first to study the health effects of TV binge-watching, has found correlations with weight gain, poor sleep, anxiety and social isolation. A UB professor’s new book about train porters in 19th-century Canada sheds light on a transnational black community that helped lead the fight for civil rights in North America. A UB study found that proton pump inhibitors, a group of drugs widely used to treat heartburn, acid reflux and ulcers, significantly increase the risk of kidney disease and failure. Climate change is affected by the degree to which people perceive risk and react to it. So a UB researcher has created a new climate change model that includes human behavior. For the second year in a row, UB hit an all-time high in the U.S. News & World Report rankings, coming in at No. 89 among the nation's best universities and No. 38 among the top publics. The university has launched an identity and brand strategy that will ensure UB's story is told in a consistent, compelling and authentic manner. 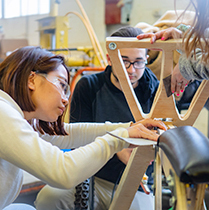 UB’s revamped and highly customizable general education program promotes intellectual exploration to enrich students’ educational experiences. UB’s Communities of Excellence unite faculty and students across disciplines to address global challenges head on. UB’s largest campaign in history will elevate our students, attract world-class faculty and support life-changing research with the potential to transform our region and the globe. Stay on track, get ahead, study abroad or pursue a special interest by choosing from more than 2,000 credit-bearing courses on campus or more than 200 online courses. Find a course or two that’s right for you. Every Friday, faculty, staff and students sport UB gear and show off their true blue pride all around campus. The 15th annual Celebration of Student Academic Excellence showcases the innovative work and intellectual achievement of UB students. UB’s Oozefest, one of the largest mud volleyball tournaments in the nation, gears up for another down-and-dirty day of spring fun.